Here is an interesting ideas to your interior design house the Sensualscaping Stairs are so extravagant and bizarre in the same time with 3D effect image, that I think you’ll love it. Designed by Atmos Studio the Sensualscaping Stairs are a continuation and intensification of a simple graphic with board lines that expand like a genie released from a lamp, curling and separating and bifurcating from the wall to form the delicate edge of the stair treads, lifting into the air to rise as the veil of the balustrade. As you can see from the photos these amazing interior design has the steps extend as vegetal beams growing from the structural wall like the boughs of a tree, holding aloft a lattice of vegetation above while ensnaring the toilet throne below, their timber extensions flowing around basins and shelves and into the details of the walls beyond. 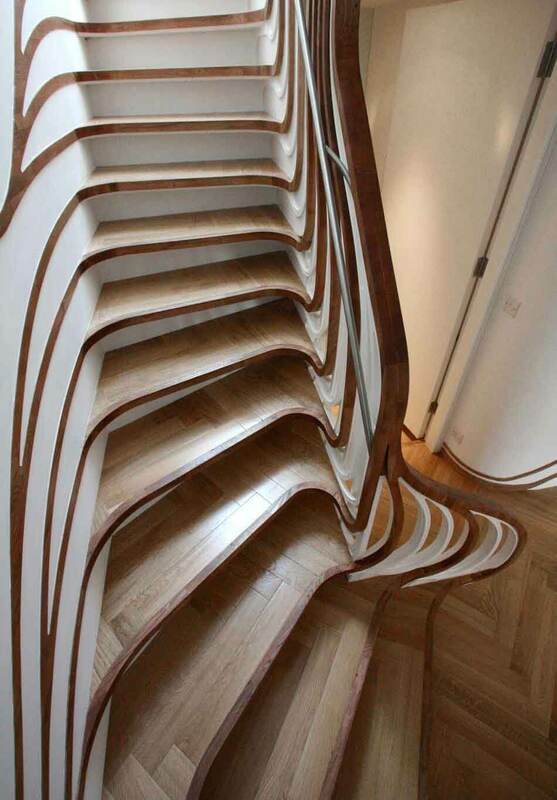 Fore construction these stairs the designer has used materials like flat-pack elements and CNC-carving sheets of MDF but most important he made the stairs from natural oak wood. If you look closer your can see the 3D design shape effect due to the perfect elements of the slots together like an architectural great view. With the increasingly popular involvement of art in colleges offering interior design degrees,professionals can more fully tie in all the properties of color, tone, and shading to form and function.